It seems to be somewhat of a mystery as to how such a small dog got trapped in a fence that was 6 ft. high, and made of wire but in Laredo, Spain, one dog manged to do just that. Luckily however nearby property owners heard the dog crying and gave the firefighters a call, who then swooped in and saved the dog. 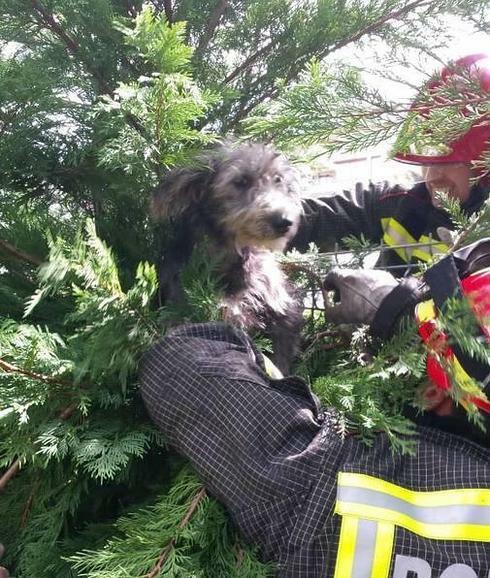 The amazement and mystery deepened when it was discovered that the dog did not suffer any injures whatsoever after being trapped in the fence for what appeared to be a long time. Unsurprisingly the dog was terrified but once rescued and on solid ground the mischievous pooch was happy and playful. The property owners who phoned the emergency services are caring for the dog until someone comes forward to claim the pet. I hope the dog finds a home AND stays on solid ground!